Gloria Guinness kept a full wardrobe in each of her seven homes, so that she would never have to pack. She saw haute couture as an art form and patronised many couture houses. 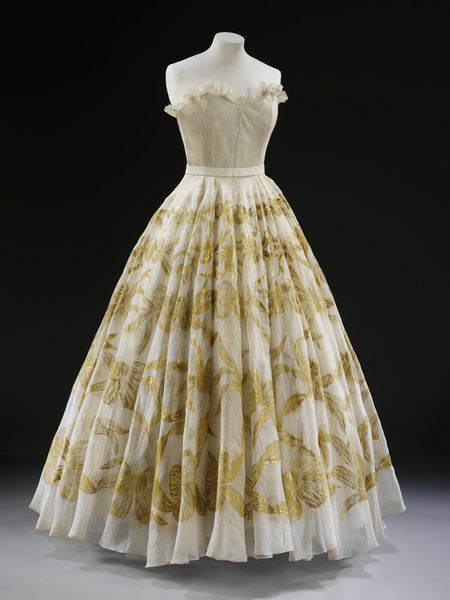 She gave dozens of items to the V&A, including pieces by Cristóbal Balenciaga (1895-1972), Christian Dior (1905-57), and Hubert de Givenchy (b.1927). Amongst these famous names were several lesser known labels, such as Marcelle Chaumont (b.1892; house closed in 1953), showing that she cast her net wide in her pursuit of fashion. 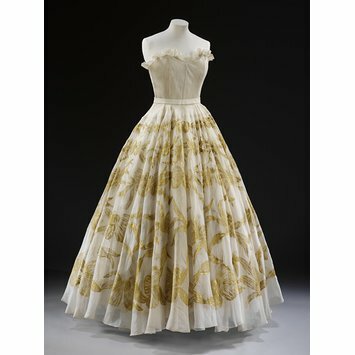 The gown is made of hand-painted organza, in the yellow and gold tones that Gloria Guinness favoured. Full length evening dress of white organza. The full waisted skirt is hand-painted with a gold design of ribbons and bows. The bodice is finely tucked, it is strapless and is boned at the seams, and it has a gathered frill at the top. There is a side zip fastening. With a petticoat of white organdie attached to the dress at the tip of the bodice and it is also boned. Belt of white organza. Chaumont was trained by Vionnet and inherited her premises and staff when she retired in 1939-40. Pierre Cardin was briefly employed as cutter in 1945. Mexican-born Gloria Guinness was one of the best-dressed women of the post-war years and patronised many different designers. This group of dresses by Chaumont, Lafaurie and Dior are in her favoured shades of yellow.